Okay so how much do I love getting ideas from blog friends? I'd say very much! But even more exciting are all these giveaways. And guess what, this little old first grade teacher just won! I won the giveaway hosted by Frogs, bees and under the seas. 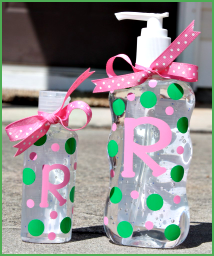 So I'll be receiving one of these adorable bottles of hand sanitizer from Porter's Polka Dots! Then as if things couldn't get any better, I find out that Rachelle and Natalie at are giving away a $100.00 gift card to The Container Store. And if you just saw my classroom post, you know that containers are my obsession. So hop on over and join in the giveaway fun! Or don't, because I sort of want to win! Congratulations! :) What a cool prize. Containers are my obsession, too.